Non-dancing cats and enchanted performance halls - Blather. Rants. Repeat. 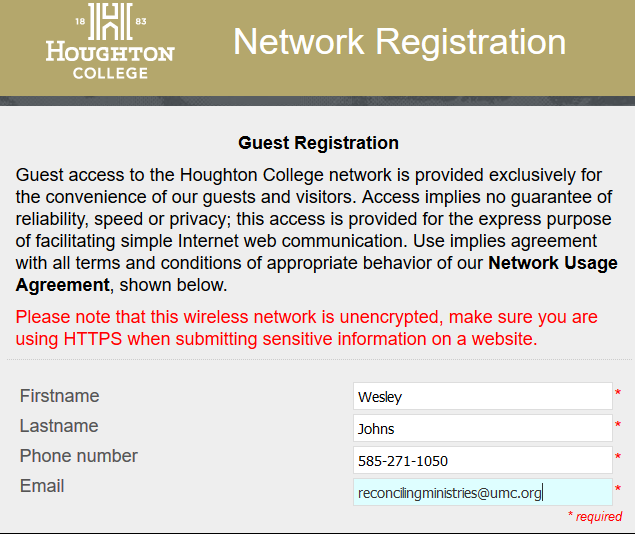 Tuesday evening- Where The Hell is Houghton, New York? I'm now two days into what promised to be a ridiculously busy week, but the future busy-ness is now down a bit. I got out of a short but annoying trip for court out of town tomorrow, but still have two scheduled back in Rochester on Thursday. I also went there today, to finish settling one case, making progress settling two others, and meeting a new client there. So why am I now a good seventy miles south of there and almost as far from home? Music. It hath charms, as you know. And I could use some right about now. Emily has called many times over the past few days. Cameron's uncle, his dad's identical twin brother, is very ill. As in prognosis-not-good ill. Cam has taken off work to be at his side at a hospital in Charlottesville, close to an hour away, and Scott has also headed down to be with his brother. Making things worse, when Cam sent in his taxes expecting a significant refund, he followed my otherwise good tax advice and gave them his new address. What we didn't realize was that it hit an algorithm someplace that flagged the refund for identity theft; they reversed that designation once he finally got through and verified all the information from the return, but it's still going to be at least a two-week delay, maybe closer to two months, before it shows up now. So I promised to advance some against it as soon as our state refund comes through. Monday wound up being book-ended by two good deeds by two good people: me and the Missus. A friend of hers texted her late Sunday night - her boykitty had a Monday appointment to be fixed, and her ride had ditched on her. She lives in the city, does not drive, and had pre-paid at a clinic that does this on an income-based system. So she had to go when the appointment was. Eleanor took the friend and Merlin to the clinic first thing, but she was working past the short pickup window, so I volunteered to do the other half of the driving. I’d never heard of this type of clinic before, although it makes perfect sense. In order to provide this service at a reasonable cost, and not go broke themselves, they bring everyone in at the same time at the beginning and end of each day, and give the instructions for leaving and taking home to everyone at the same time. Then, everyone drops off and collects their kitties (the patients on this day- dogs go in on different days) in some predetermined order. It seemed very well organized, at least at the end of the day, except I had misunderstood that everything started exactly at 5 p.m. so we wound up getting there about half an hour early. We found a nearby diner and had coffee while those minutes passed. It was a bit cramped getting a cat, carrier and passenger all into one side of a small two–seater car, but we managed, and mama and Merlin were safely home well before Eleanor got home that night. Tuesday then proved to be an even longer day, but for happy reasons. It began with a brief but frustrating appointment in Buffalo, and then a day spent on the road mostly in Rochester, where things went OK. 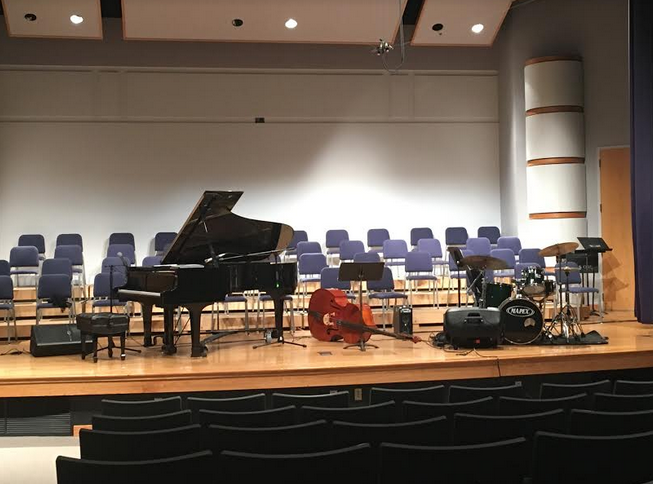 I then took a drive to a nearby county where I had to file something, and it was on the way to Houghton, and even more remote location where a friend of ours and her jazz trio performing at the college there at seven last night. 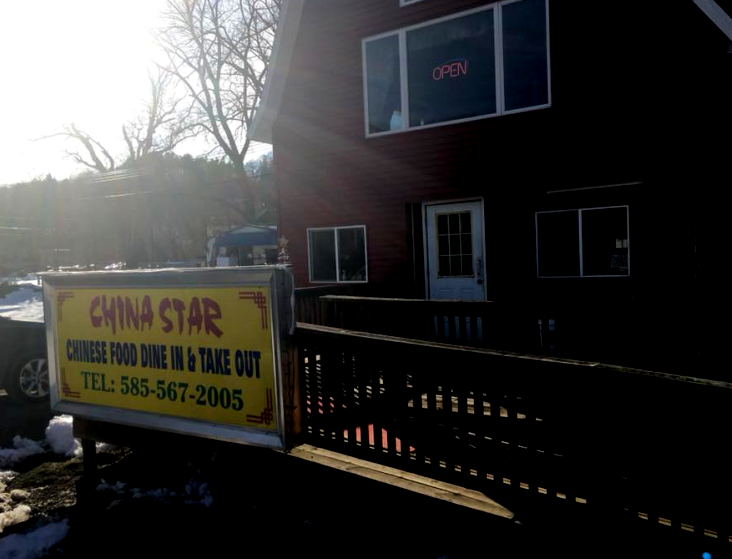 It was cheap enough, plenty filling, but the dining area was upstairs in what looked like (and probably once was) a barn with very little heat on a chilly still-winter night. I brought leftovers home, but finally pitched them tonight. The phone number belongs to our last UMC congregation in Rochester, the largest supporter of LGBT inclusiveness of all their churches in upstate New York; the (nonexistent) email address name-checks the leading pro-LGBT movement within the more liberal (but still stone-age-on-the-subject) United Methodist branch. 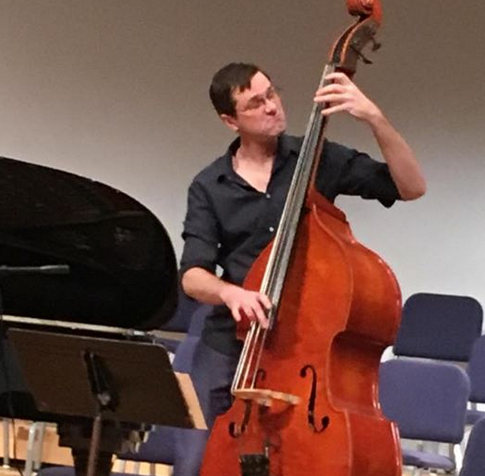 There were Psalms engraved in bricks throughout the paths of the campus; its student center bookstore closes during the daily chapel hour; and yet the headliner's bass player proudly acknowledged, in the bio that the college printed for him, that he has worked onstage with Lady Gaga. Maybe they don't even know who she is. She's singing and playing here, one of relatively few she sang on. 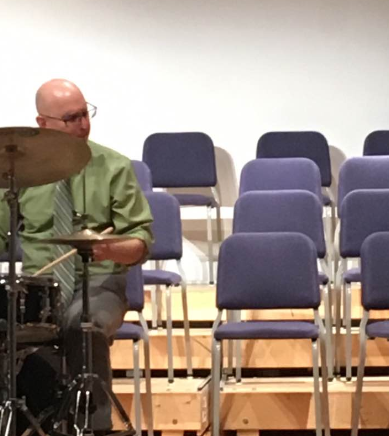 Many of the songs were from her most recent album- jazzed-up variations on well known traditional hymns, many of which are still among my favorites and/or best-known. 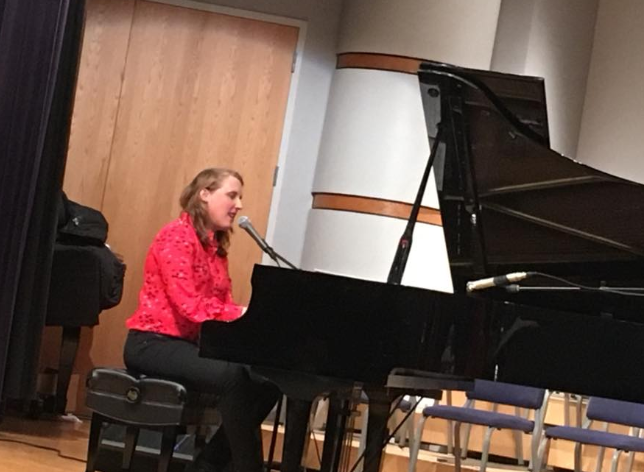 She also played pieces from older albums which we've had for years, including her blending of Chopin and Jobim and a number of original pieces. It was a small but hug-filled gathering- some of her family joined her from even longer trips than the one I'd taken- and her mom brought cake for her birthday:) I had a long haul and a longer Wednesday then looming, so I said an early goodnight, headed home by a completely different set of twisting back roads (passing the best name for an antique store ever on the way- Junk and Disorderly;), and was home by 10. Wednesday- Aren't WE the ones who get the snow? I still wound up getting up and out at an early hour, running some early errands including replacing the just-departed case for my phone and cranking on old coots in the Wegmans cafe. By mid-afternoon, I was ready to call it a day again and sit back with the Shape of Water DVD Eleanor had picked up, but we both wound up with unexpected plans. Merlin, true to his name, managed to work his way around his Cone of Shame and started going at his parts, so Eleanor wound up doing the pickup-and-take routine all over again, so her friend could get a more restrictive one for him at Petsmart. After working until 7, she didn't get back from that until minutes before 9. As did I, but for more relaxing reasons. For right before I left the office, I saw Deanna posting- from here in Buffalo. Asking for wing recommendations- since her afternoon flight back to NYC had been canceled due to the heavy snow. Not ours; theirs. I instantly knew what to say- it's got to be Duff's, and the original one on Sheridan- and what to do. 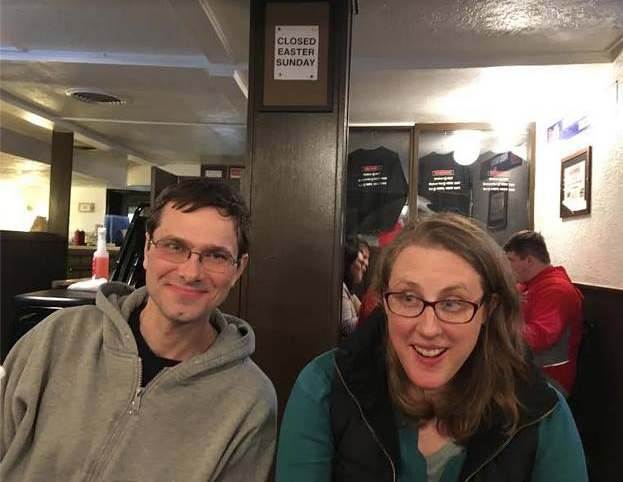 I invited her and Daniel from her trio (Scott had gone on ahead of them to meet family) to be my guests for her birth-plus-a-day at Amherst's finest purveyor of chicken parts. Just one problem: they had no car, and mine can only handle one human passenger. But thanks to ride-sharing, they were able to get there around 7, and we had a couple of fun hours talking about their music, families, and the universal languages of music and kindness. Another day, another alarm, another long drive. Both bookends of court appearances wound up going away- the early one because I settled it literally 40 minutes before it was scheduled to start (and didn't confirm the settlement being finalized until about five minutes to 5 this afternoon), the late one because the client never confirmed retaining me ahead of time and I was not going to go too far and too late for something I might not ever get paid for. So in between, I cranked out a ton of paperwork, but not without a little silliness. This entry was originally posted at https://captainsblog.dreamwidth.org/1516048.html. Please comment here, or there using OpenID. bummer about the tax mix up. I hope they get their money sooner than later. my last dog molly was spayed thru a low income clinic like that. i had to pay ahead of time for it (and it was about half the cost it would have otherwise been). glad you and eleanor could help her get her kitty there and back in time. 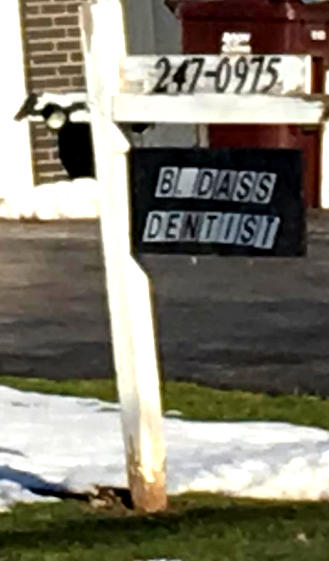 i like the idea of the badass dentist sign too.